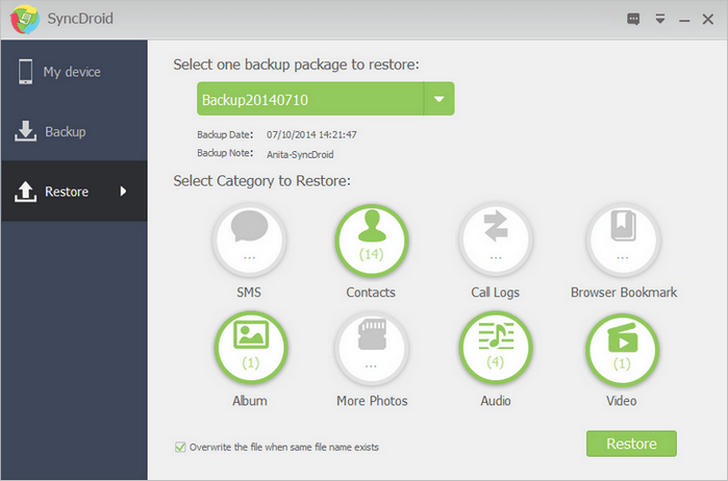 How to Backup and Restore Android Phone with SyncDroid? 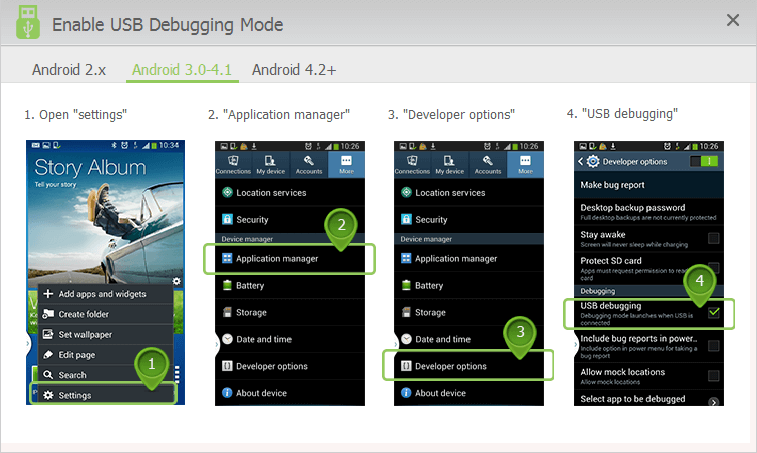 SyncDroid is Android sync manager works on both Windows PC desktop and Android products. Sync SMS, Contacts, Call Logs, Bookmarks, Music, Videos, Camera Photos and SD Card Photos between android phone and PC easily. Supports almost all Android devices, like Samsung Galaxy S5, Samsung Galaxy S4, Galaxy S3, Galaxy S2, Galaxy Note / Note2, Motorola Droid, RAZR, Sony Ericsson Xperia, LG Optimus and many other devices. 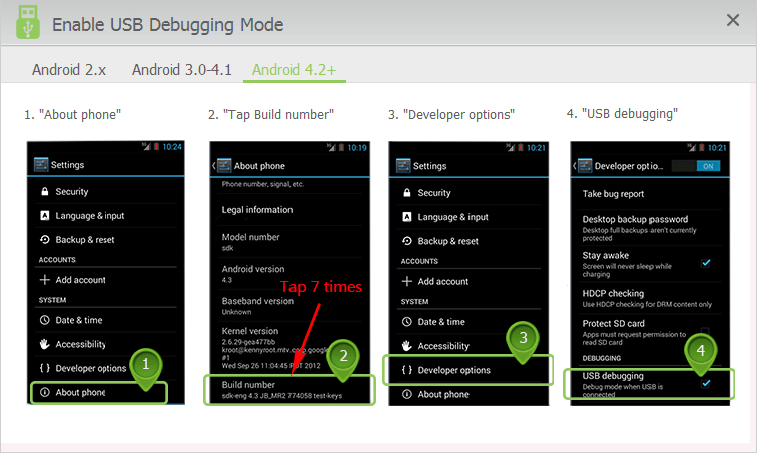 Three Steps to backup and restore data from Android by referring to SyncDroid User Guide shown as below. Method 1: Connect your phone via USB cable. 1. Connect you phone to PC via USB cable. 2. 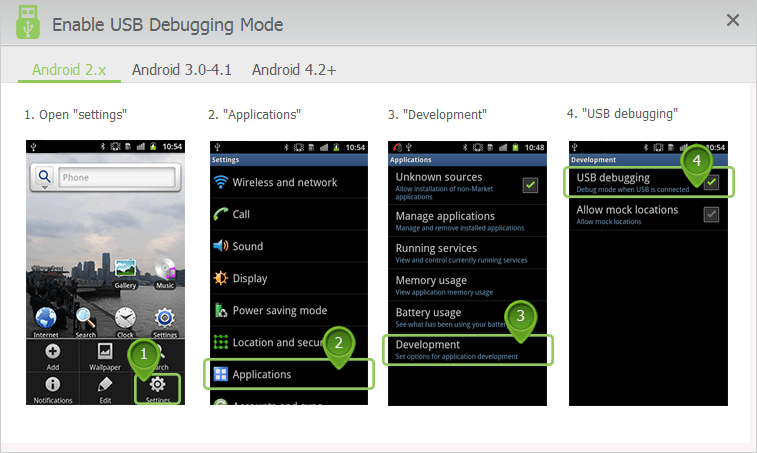 Turn on the USB debugging mode on your phone. Method 2: Connect your phone via Wi-Fi network. 1. Download and install SyncDroid App to your phone. 2. 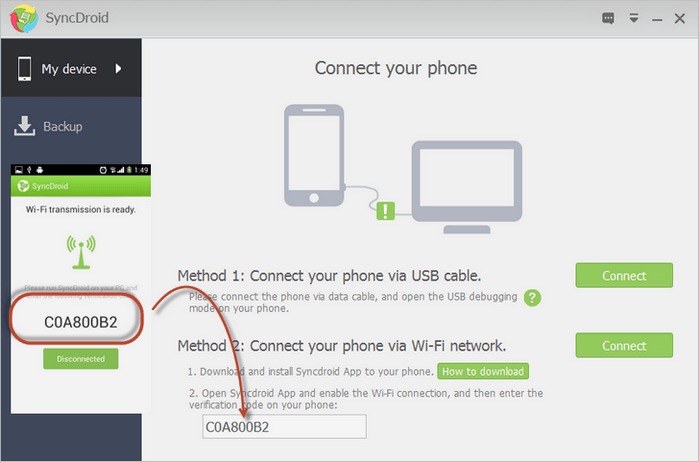 Open Syncdroid App and enable the Wi-Fi connection on your phone, and then enter the verification code. 3. Click Connect button to connect your Android phone to SyncDroid via Wi-Fi network. Backup or restore any or all of these data types: SMS, Contacts, Call Logs, Bookmarks, Audio, Videos, Camera Photos and SD Card Photos. Please keep the USB cable or Wi-Fi connection while backing up android phone. 1. 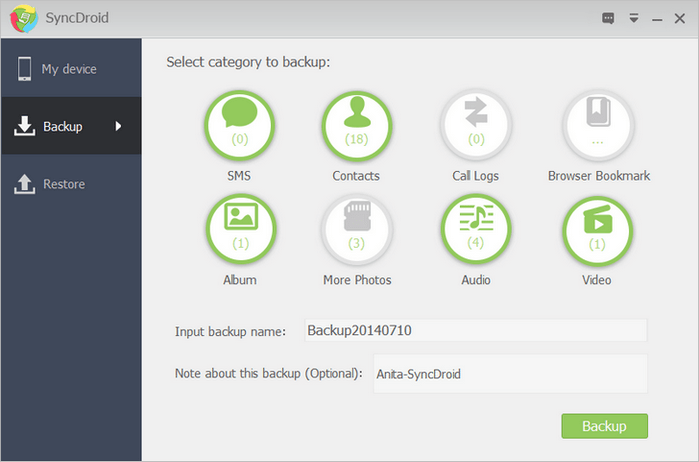 Choose items you would like to backup from: SMS, Contacts, Call Logs, Bookmark, Audio, Video and Photos. 2. Input backup name and note to specify the backup file for restoring data in future. 1. Select one backup package to restore from your computer. 2. Select category you would like to restore from: SMS, Contacts, Call Logs, Bookmark, Audio, Video and Photos. 3. Choose whether to overwrite files when same file name exists. "I find your programs is BEST i love it!! That easy job and transter PC to my Samsung Galaxy S6 and S6 to PC and easy everything i test everything. Thank you muchh FREE APPS and unlimited i love much this!!!"